Ametco perforated Sun Shades begin with 1/8" thick aluminum or galvanized sheets that provide from 10% to 50% open area. 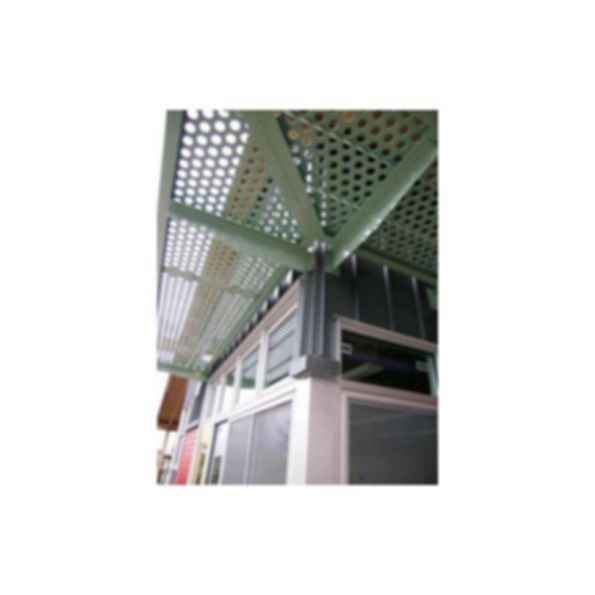 There are numerous patterns and styles of perforations to choose from. The angle or tube frame required is engineered for each job based on the span and depth. After fabrication Ametco's Sun Shades are finished with a polyester powder coating. The powder coating gives an extra tough of appeal to the sunshade, harmonizing with its surroundings. Below are illustrations of some of the configurations that you can select with the size perforation of your choice. Custom Glass Canopies Efficient-Tec International LLC.